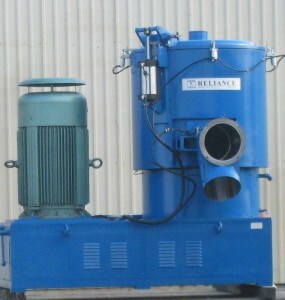 Reliance’s knowledge in manufacturing its own mixers allows us to rebuild mixers of different makes and models. 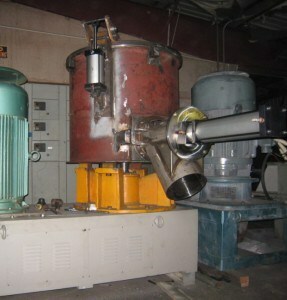 We are more than willing to rebuild and supply used mixers with our standard warranty. We will change out parts that are worn and rebuild the tools and air cylinders as well as build up any gouges in the bowl, lid and discharge plug. 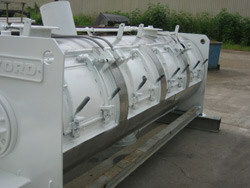 The exterior of the unit is sand-blasted and painted to our Standard Color. The motor will be checked out and rebuilt or replaced if need be. We will even be able to make any optional changes at your request. If new controls are required we can supply a Push-Button or PLC Based Control Panel based on your needs. Rebuilt VFM Mixer:The high intensity mixer shown below was sent to Reliance needing some major repair and upgrades to make it usable for production. 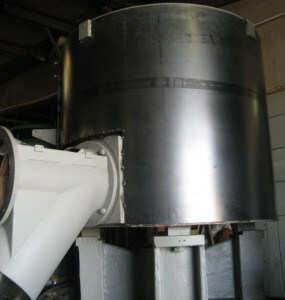 B) After changing out the bearings, seals, belts, and rebuilding the interior of the bowl, Reliance added a new lid lifting mechanism equipped with a pneumatic cylinder. 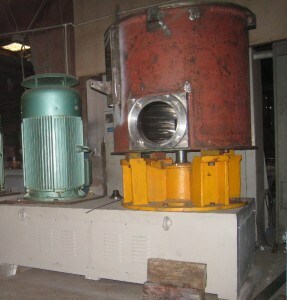 C) New flow bars, jacket, insulation, and stainless steel cladding was added to the bowl exterior to allow for the flow of hot oil or cooling medium. The motor was rewound upon customers request to ensure a longer lasting motor. D) A new discharge chute was also made with pneumatic assist to open and close the plug. The unit was then shipped to a Masterbatch Manufacturer. 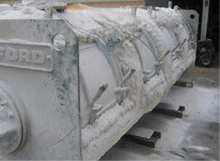 A) As shown below, a cooler of a different manufacturer was sent to Reliance for rebuilding. B) We stripped the old jacket that had been rusting due to a bad water supply. 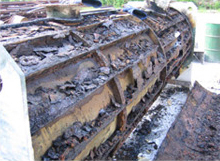 Steel jacket with a Stainless Steel jacket to counter the rusting caused by the water supply. Due to the new jacket and flow bars, the Cooler was rated for a higher PSI allowing cooling media to flow faster throughout the Cooler which in turn reduced the cooling cycle time.